There is a mutually beneficial relationship between technology and craft, as well as consumers and manufacturers. Jaunt around the planet without ever getting in a plane by scrolling through this issue that covers New York Design Week, chiefly ICFF and WantedDesign, Clerkenwell Design Week in London, and Evteks in Istanbul. Added value comes when the plethora of events are cross-referenced and dots are connected, creating a picture of the home fashion marketplace. Also in this issue subscribers can find over ten color palettes with Pantone references up through A/W 15-16. Get inspired with the June edition! New York — May was full of variety and very multi-cultural. We attended events in the US, the UK, and Turkey. While there were distinct differences in geography, there were underlying currents and definite similarities in designs across the board. 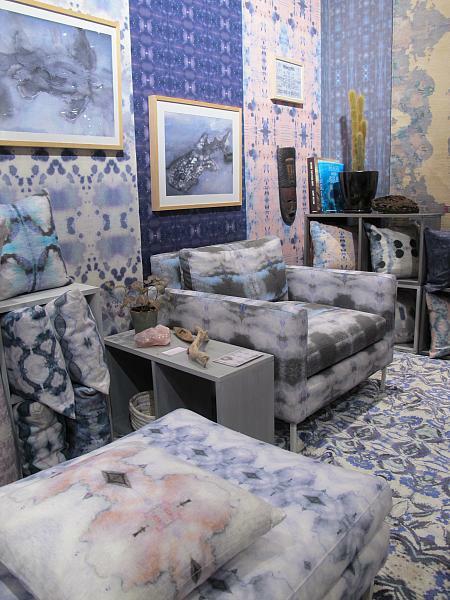 Learn about the creative industry’s secret weapon, the consumer as the manufacturer, as well as see a plethora of products selected from the heaps on show during New York Design Week. Worldwide — Starting in London at Tent, flying over to Fuori Salone during Milan Design Week, then crossing the Atlantic for New York Design Week, only to accumulate more frequent flyer miles as we finalized the journey in Istanbul, we thought that perhaps our heads were spinning from all of the travel, but in reality it is the designs themselves creating a kaleidoscope of color and pattern. Istanbul — The Turkish textile association TETSIAD represents 95 percent of production capacity of Turkish home textiles. TETSIAD researches the textile sector and conducts studies to support its members’ manufacturing and offers a platform for exhibitions locally and internationally. For the 2014 edition of Evteks held in Istanbul this May TETSIAD reached out to the NellyRodi trend forecasting agency to envision the next seasons’ trends, using Turkish textiles as visual support. Istanbul — TETSIAD called upon the French trend forecasting agency NellyRodi to develop trend displays utilizing Turkish textiles at Evteks 2014 this May in Istanbul. The agency showcased Spring/Summer 2015 and Autumn/Winter 2015-16 under the theme ‘Imagine!’ on a single platform. In order to make it more cohesive, we have separated the different seasons into their own galleries. Dive into the fall and winter here. Worldwide — The direction seen within this gallery embraces cultural heritage and is influenced by the aesthetic of the Dutch Masters, a direction which we have also seen in wallcovering and decorative accessories for the home. In textiles we see digitally printed lace and pointillism effects, dressy plain weaves, embossed small scale patterns, oversized clipspots on jacquards, and exaggerated slubs in tweeds. Worldwide — Deep, dark colors and complex, sophisticated designs are radically unexpected. A collection of colored blacks with a camel accent, this color palette exudes power and intellect. What once seemed drastic and far-fetching is now a reality. In fabrics showing off technical prowess is what it is all about. Textural broken stripes, crackled camouflage, hypnotic prints, double knits, yarn dyes, foils, and irregular blotch printing are some examples. Worldwide — It is ironic and counterintuitive that a direction with such bold patterns and colors is all about blending in with the crowd. Vibrant colors and daring graphics are almost commonplace as this trend’s movement catches momentum and gains popularity. Tonal configurations and statement pieces are part of the masquerade. Worldwide — This has quite a different tune to the other directions, balancing out as a type of contra trend. The colors are further subdued and it is brought down to a more human scale. What are the meaningful things in life? Getting together in person trumps any social network and materials take on a very tactile appearance. Compassion and understanding are woven into the fabrics. Worldwide — Synthetic and natural colors mingle together in this palette. Reality and illusion dance side by side and uber personalization leads to the consumer manufacturer. Appropriately this trend contains many blurred lines, ombré looks, and transitions of color. Yarns play an important role here and metallic accents are so subtle that they are almost unnoticeable. London — In this week’s gallery we look at over 50 specially-selected product shots we photographed during Clerkenwell Design Week. CDW has become an important event on the London design calendar. Although mainly showcasing local companies, we additionally came across some budding creatives from Estonia and Russia. Plus, subscribers can also view a large selection of textiles spotted at the new location added to the CDW map, the Crypt on the Green at St. John’s Church. Paris — There are many paradigm shifts catching our attention of late. Consider the debates around the sharing economy. It seems only appropriate that the forthcoming Maison&Objet will house three areas at its exhibition under the theme of Sharing. This week’s gallery gives readers a glimpse of the three Sharing directions as well as houses a selection of products the Trendease Team believes support this movement. Paris — While bouncing between conferences, we bring you a sneak peek of the Autumn/Winter 2015-16 directions for leathers and furs to be presented in September at Le Cuir à Paris. Subscribers can find the trend themes under the More is More headliner, color descriptions, and dozens of material examples within this newsletter. Worldwide — It was been another full week of product launches, exhibition previews, and student final year shows. Now it is time to sit back, reflect, breathe deeply and have a rich, flavorful cup of tea. One cannot help but be inspired by the selection in this week’s gallery boasting creativity around teatime. Subscribers can see the collections here and learn more about their sentiment.